When Dominic showed me this tea, I initially thought the beauty of the “moss colored stones” was enough to entice me to try this unique jade oolong. Then he told me the tea leaves are coated in Ginseng powder and Stevia, and my nose scrunched up and a few doubting comments came out of my mouth. I will admit I am not a fan of Stevia Leaf. Years ago, when we first started carrying Stevia Leaf in our shop, I had one too many unfortunately strong brewed sample cups as we tested it out to get the steeping time right. As much as I loved providing it as an alternative to sugar for our customers, I swore it off personally after that. But fate had other plans for my taste buds when these tiny little matte green pebbles arrived and I just can’t turn down a chance to try something new. Why Blue People? No ties to any of the different Blue People you may be thinking of, rather, this high mountain jade oolong tea from Taiwan is pressed tightly into little mounds, then coated in a blend of Ginseng and Stevia powders to give its blue pebble like appearance and memorable name. But the Ginseng and Stevia bring something far greater to this oolong than just a unique look. Upon first infusion (steeped 3 minutes with 180ºwater), this tea has a crisp, slightly cooling (almost minty fresh) flavor with a strong and sweet stevia leaf aftertaste. The first few sips yield an energizing and uplifting feeling while the last few leave a sweet and fulfilled taste in the back of your throat. Not one to waste the opportunity to re-steep tea leaves, I found the second infusion really brought out the best in this lovely jade oolong as the tea leaves completely unfolded, and the sweet aftertaste became more subdued. The third infusion is far more mellow, but still has a nice aroma to it. 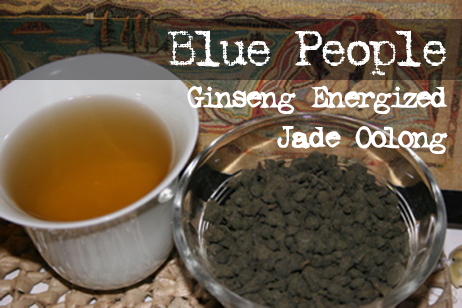 Blue People tea is energizing, sweet and uplifting- a terrific way to start off any morning or to drink as an early afternoon pick-me-up. Now available in our teashop and online.